We are fortunate enough to live in Boston, MA and we were able to go to Children’s Hospital. 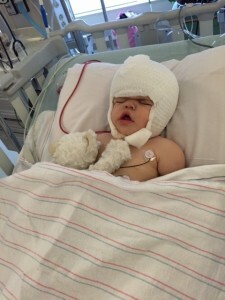 On 4/7/15 Caroline had a cranioectomy and a frontal orbital advancement. She had been diagnosed with uni-lateral craniosynostosis. The nursing staff LOVED the prayer chain and although you cannot see it in the pictures, we did have it draped over her hospital crib. We cried as we read each thought and prayer…..Her cranio care bear never left her side and we had family and friends praying for us and wearing their purple Cranio Kids are Amazing bracelets. Our care package had everything I needed- I didn’t have to go running out to the store to get toiletries, socks, gum etc because the amazing moms at Cranio Care Bears had thought of everything! It’s been a month and a half since her surgery and already her stiches are almost dissolved and her hair has grown back over the scar. Because her forehead was over corrected we still have a another 6 months or so before she looks like herself. If anything, parents should be prepared for a LONG surgery, the amount of swelling that goes on and how uncomfortable their little ones will be for the first week. The drs and nurses at Children’s did everything they could to make her comfortable, and let me hold her – the nurses are ALWAYS happy to let you hold your little one, you just need to ask.